Wheel of Goalies: Who Will Start for Philadelphia in 2013? With the Philadelphia Flyers seemingly waiting for the Stanley Cup Finals to conclude to amnesty Ilya Bryzgalov and his out-of-this-world contract, a question that has been asked far too often since Ron Hextall retired in 1999 is surfacing yet again: who will start in goal next season? As always is the case, there are a few options the Flyers have in replacing Ilya Bryzgalov. Assuming the Russian will be packing his bags in the coming weeks, Philadelphia could either stay in-house or look to the open market to solve their goaltending woes. So which goaltenders are options to start in net for the Flyers in the 2013-14 season? The most likely option in net currently resides in Philadelphia. In the final weeks of the season, Mason had some brilliant performances after being shipped to Philly from Columbus at the trade deadline. At 25 years of age, Mason, arguably, has his best years ahead of him. A former Rookie of the Year in Columbus, Mason compiled a 2.59 goals against average with a .916 save percentage in 20 games last season. Strengthening his case to be the starter is the fact that he seems very comfortable in Philadelphia. There were numerous times towards the end of the season when Mason expressed his appreciation for the Flyers’ goalie coach and how Jeff Reese helped him make some key adjustments that he lost sight of in Columbus. With a full offseason of those two working together, it will be very interesting to see how well Mason develops. The Flyers gave up on a young Sergei Bobrovsky because they were tied down with Bryzgalov – and we all know how that’s turned out so far. Now they have another opportunity to hand the reigns over to a goalie on the rise. The hottest name around the rumor mill, Bernier has unfortunately hit a roadblock otherwise known as Conn Smythe Trophy winner, Jonathan Quick. In order to land Bernier, though, the Flyers will need to ship away one of their top young forwards in Matt Read, Brayden Schenn or Sean Couturier. But trading one of them for Bernier may be the answer to an otherwise never-ending problem. This season, the 24-year old went 9-3-1 with a 1.87 goals against average mark and a .922 save percentage. The only problem with trading for Bernier is that there’s still a lot to be learned about him. It’s always a risk trading a proven player for someone who has that big “P” word attached to his name: potential. Yet, that might be what the Flyers need to do at this point. Two offseasons ago, Philadelphia went with what they thought was a sure-bet in Bryzgalov. That turned out disastrous. Perhaps it’s time to go young and take a high-risk, high-reward approach with Bernier. 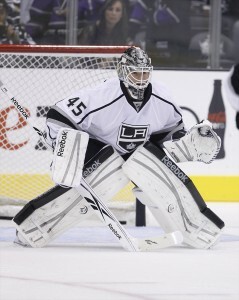 Additionally, if they did acquire Bernier, Mason would revert to being the backup. Having a former Rookie of the Year as your insurance option is definitely reassuring. Bringing Luongo to Philadelphia would definitely cause some groans from Flyers fans. Despite being the best goalie in the league when he was at the top of his game, acquiring Luongo would be a huge risk. First, there’s the problem with his age. At 34-years old, the former first-round pick in 1997 probably doesn’t have many great seasons left in the tank. Then there’s his playoff struggles. And for anyone who knows anything about sports, there may not be any city that is hungrier for a Stanley Cup than Philadelphia. Having someone in net who has choked away playoff games in the past would not be welcomed by the fans. If the Flyers were to trade for Luongo, they would be banking on him being a stud in the regular season, as he has been for the most part of his career. It’s the playoff concerns that make Luongo a shaky option, especially when there are younger goaltenders available with a higher ceiling. Like with Bernier, the Flyers would need to trade someone like Brayden Schenn to acquire Luongo and his high price tag. Would that be worth it when that same trade could land Bernier? I can’t believe I’m speculating Thomas as a legitimate option for the Flyers next season, but Randy Miller of The Courier Post tweeted a few months ago that Thomas is rumored to want to play for Philadelphia next season. Do Philadelphia fans really want a 39-year old goalie who took a year off to be their starter? No thanks. I’d rather have a 48-year old Dominik Hasek join the team. Buffalo seems content with moving on from Ryan Miller. St. Louis, surprisingly, could be a team interested in the services of Miller. 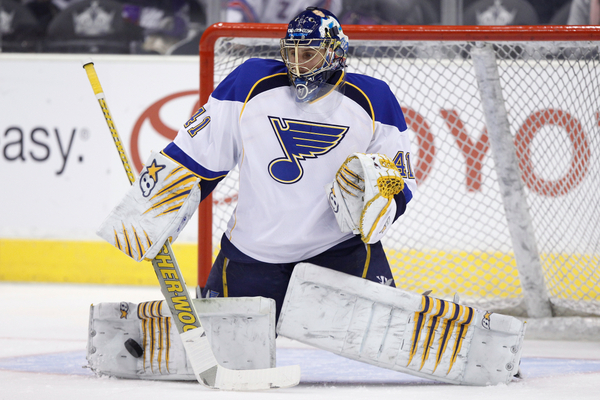 Despite having two quality goaltenders, the Blues might be moving on from Halak. After reported altercations with head coach Ken Hitchcock, Halak could soon be on his way out. At 28-years old, Halak has been a reliable goalie with the Blues, which included a fantastic 2011-12 season in which he posted a 26-12 record with a 1.97 goals against average and .926 save percentage. He won’t draw the biggest headline as someone like Roberto Luongo or the excitement that adding Jonathan Bernier would bring, but he may be the safest bet out of everyone mentioned in this article. He still has a bright future in this league and he’s proven to be a bonafide starter in net.